Supply Chain experienced consultants (average of 17 total years and 12 years industry experience) develop tools and services based on their unique knowledge and work activities. PROLIM is one of the most acclaimed Aras technology partner for PLM solutions. PROLIM in association with Aras has provided many techno-solutions to MNC giants in various domains. Product Lifecycle Management helps you manage complex, cross-functional processes, coordinating the efforts of distributed teams to consistently and efficiently develop the best possible products. 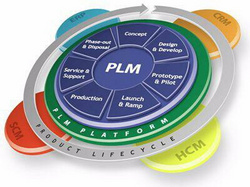 The PTC PLM software system manages all aspects of the product development lifecycle, from concept through service and retirement. Siemens PLM Software, is an integrated and advanced CAD, CAE, and CAM solution. NX is used for parametric design, direct solid and surface modeling, simulation with respect to static, thermal, dynamic and electromagnetic aspects and manufacturing. In order to meet excellent quality standards, we are supplying PLM Software. Siemens PLM Software works collaboratively with companies to deliver open solutions that help them turn more ideas into successful products. Our PLM solutions can help you make smarter decisions that lead to better products, maximizing the value derived from your products throughout their entire lifecycle. Siemens PLM software welcome’s the students who have enrolled for the PLM training through our authorized training partners it is the intent of siemens PLM software to create an eco-system of plm knowledge work force through training activities at a retail level and bring plm classes for the masses through the authorized training partner network across india. We are amongst the most reputed names in the industry, offering PLM Software.